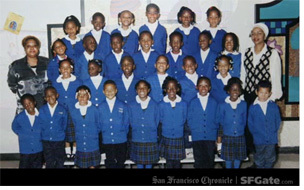 The Chronicle has a nice feature today on a class of Kindergartners who enrolled at George Washington Carver Elementary School in the 1995-96 school year. Through extensive reporting, the Chronicle found all but a handful of the students, and reports on what became of them — comparing what actually happened with state statistics that predicted at least a third would fail to graduate from high school. This entry was posted in Improving schools, issues and tagged achievement gap. Bookmark the permalink.